If the definition of insanity is doing the same thing over and over, but expecting a different result, then Donald Trump is institutionalizing insanity as a standard operating doctrine for his presidency. Throughout his term in office he has stubbornly clung to blatant lies and policy proposals that defy logic or reason, even after he has been apprised of the errors in his alleged thinking. 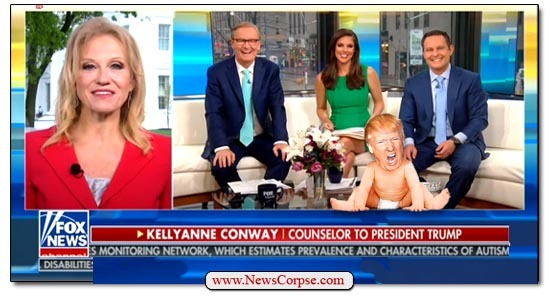 On Thursday morning Trump called in to Fox News to frantically unravel in a half hour interview – or more accurately, a frothing tantrum – with his fawning Fox and Friends. In the course of the spectacle, Trump admitted that he lied about how long he was Russia; threw his lawyer, Michael Cohen, under a freight train; contradicted his prior claim that he knew nothing about the Stormy Daniels affair; threatened to interfere with Justice Department activities and personnel; declared James Comey guilty of something or other; and lashed out at Hillary Clinton, Barack Obama, and, of course, the media. He was so deranged that the hosts actually struggled to interrupt his extended outburst and eventually cut him off. The consensus reaction to the segment from across the media was that Trump was “unhinged,” “shocking,” “bonkers,” “bizarre,” “jaw-dropping,” “unwieldy,” “crazy,” “surreal.” And those were the more diplomatic descriptions. It was so awful that retired Four Star US Army General Barry McCaffrey tweeted that he is “Worried about health of Pres Trump.” Michael Avenatti, Stormy Daniels’ attorney, said that “the President should appear on Fox and Friends every morning.” And he just might get his wish. Conway: The president had a great time bringing his case directly to the American people, as he does on social media and in these bilateral Q & A’s certainly at the south lawn, and in the press pool sprays, and with other interviews. And the president has said that he would like to, perhaps, come once a month and as news breaks. Doocy: Wait. Come to Fox and Friends once a month? (Giggling and clapping) WOW! Kilmeade: Alright. Fantastic. That’d be great. Conway: He said he’d like to replicate that on pretty much a monthly basis. And you know, back in the private sector he was on every week. Every Monday. Also during Trump’s interview, he gave himself an A+ for his performance in office. It’s that sort of self-delusion that makes it possible for him and his disciples to pretend that a nationally broadcast catastrophe was a huge PR success. But if he is determined to have a regular gig at Fox again, he should know that there’s a lot of support for him to do that – among Democrats. Go for it, Donnie. ← Mueller Will Find that Trump Committed Criminal or Impeachable Offenses Says – a Fox News Poll?